» Episode Guide » Viewing Episode: 守り神カプ・コケコ登場！挑戦、オレたちのZワザ! !/Enter the Guardian Deity Kapu-Kokeko! Let Us Attempt To Master Our Z-Move!! Alola! New Islands, New Pokémon!! Good Rotomorning, I am the Rotom Zukan! The second part of the super extravagant keyword quiz which was part of the 1-hour special for Sun and Moon was: wa (ワ). The third and final part of the super extravagant keyword quiz which was part of the 1-hour special for Sun and Moon was: za (ザ). Entries must have been postmarked Thursday November 24th, 2016 or earlier and must have written the keyword and necessary data on a postcard. Abareru-kun hosted a segment at the end of the 1-hour special. He wanted to feel like he had gone to the Alola region too, so he put on some Hawaiian looking clothes to make him feel like it's eternally summer. Since he felt that way, he decided to drum up some further excitement for this new series, so he appointed himself Anime Cheerleading Chief! He announced that on the next weeks episode, the data broadcast would start having a quiz corner where viewers could win prizes! People could participate by answering the questions with their remotes. He also announced that there would be a system that works with the video games Pocket Monsters Sun/Moon. Abareru-kun announced that there would be another 1-hour special for the next week and a preview showcasing its most intriguing content was shown. 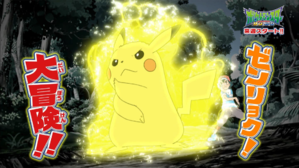 Pokémon Verbünde dich mit Pikachu!